A bi-weekly show about gaming of all kinds. Board Games, Card Games, Miniatures Games, Role Playing Gamings and much more. The show will include geek topic discussions, board game walk through and reviews, gaming community and industry news and role playing game theory topics. Topics may include Privateer Press, Games Workshop, Wizards of the Coast, Fantasy Flight, Spartan Games, Z-Man Games, etc. For more info, including forums for fans of the show, see The Secret Cabal Guild Page. 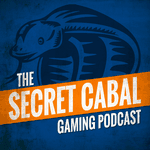 The Secret Cabal Gaming Podcast is a bi-weekly talk show about board games, card games, miniatures and role playing games. In each episode, the four founders of The Secret Cabal, Jamie, Brian, Chris and Tony start the show off with light talk about what gaming they've been up to and other potentially other geek related topics. We also do a walkthrough and review of a board or card game followed by a round table review of the theme mechanics and gameplay. Tony brings you gaming industry news and the rest of us throw in our two cents on each item. And finally we host a round table discussion pertaining to role playing games. The Secret Cabal itself, is a York, Pennsylvania based gaming club founded by the four regular hosts of the podcast. The club motto: “Striving Lest Our Company Be Lazy, Cowardly Manure” If you want to know more read About The Secret Cabal now.